The Alaska State Quarter is the 49th coin in the 50 State Quarters Program. The coin depicts a grizzly bear holding a freshly-caught salmon in its powerful jaws, as it emerges from a rushing stream. The inscription, "The Great Land" appears to the right, below the North Star. Alaska was admitted to the Union on Jan. 3, 1959; the year Alaska became a state appears below the inscription "Alaska" at the top of the coin. The other side of the Alaska Quarter bears the same portrait of George Washington that has appeared on the other State Quarters. The main design element of the grizzly bear catching a salmon are intended to symbolize the natural beauty of Alaska and the abundance of its wildlife. The grizzly represents strength, and the salmon stands for the nutrition that makes such strength possible. These are lovely concepts, except for the fact that the grizzly bear is actually primarily a vegetarian! 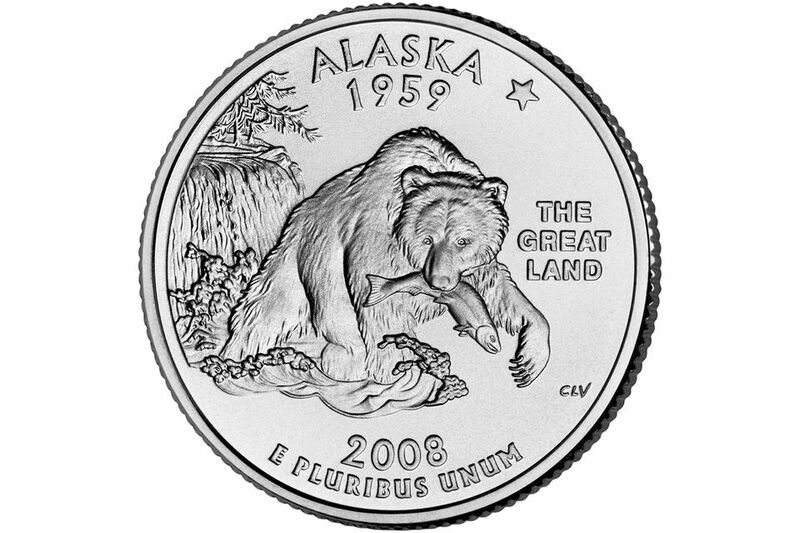 However, the grizzly is eminently appropriate for the Alaska Quarter design, as better than 98% of the grizzly population in the United States is found in Alaska. The depiction of the North Star on the Alaska Quarter is a little disappointing. The North Star is a grand symbol, the most important star in the sky to mankind spanning at least three millennium, but the depiction of the Star on the Alaska Quarter will probably be overlooked by most people. It looks just like any number of other mundane stars that have appeared on U.S. coinage, and I doubt many will realize its significance. It would have been nice if they had given it some rays, or made it larger and less generic-looking. At least it's there in some modest form! The U.S. purchased Alaska from Russia in 1867 for $7.2 million, about 2 cents per acre. Alaska has nearly 3,000,000 lakes, some of which appear only seasonally. Less than 1% of Alaska's land is privately owned. The word "Alaska" comes from the Aleutian word "Alyeska," which means "The Great Land." Alaska boasts an impressive 29 volcanoes! The total population of Alaska is well below 3/4 of a million people. A 2006 estimate puts the number at 670,053 residents. One of the most amazing facts about Alaska is that it has the westernmost, northernmost, and easternmost points in the United States! The Aleutian Islands extend farther west than Hawaii. In fact, they extend so far west that they cross the 180th meridian, placing them in the east, which is how Alaska claims the easternmost point in the U.S., too. As for the northernmost reaches, about a third of Alaska falls north of the Arctic Circle. How Much Are My 50 State Quarters Uncirculated Rolls Worth? How Much Is a 1970 Quarter Worth?